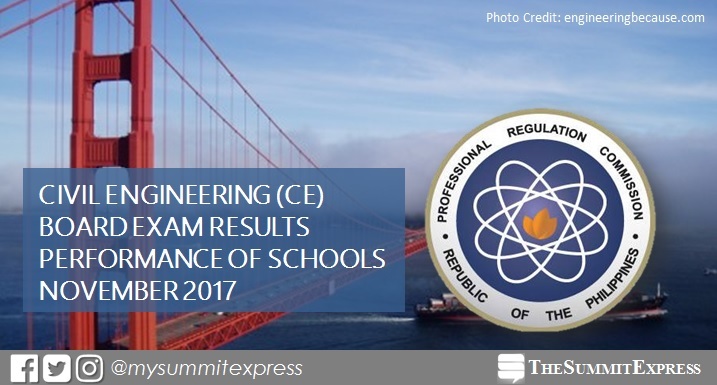 MANILA, Philippines - The Professional Regulation Commission (PRC) hailed the top performing schools in the November 2017 Civil Engineering (CE) board exam. The results were officially released on Tuesday, November 21, 2017 or in four (4) working days after the last day of exam. University of the Philippines (UP) - Diliman topped the schools with 97.41% passing rate or 113 out of 116 passed the exams. UP-Los Banos ranked second with 96.55%, 56 out of 58 successfully hurdled the tests. Bohol Island State University (BISU) - Tagbilaran got the third place with 87.04% or 47 out of 54 examinees passed. PRC conducted the Civil Engineer licensure exam in the cities of Manila, Baguio, Cagayan de Oro, Cebu, Davao, Iloilo, Legaspi, Lucena, Tacloban, Tuguegarao and Zamboanga on November 11 and 12, 2017. In the November 2016 Civil Engineer exams, University of the Philippines (UP) - Diliman topped the schools with 96.08% or 98 out of 102 passed the tests. UP-Los Baños (UPLB) ranked second with 95.16% or 59 out of 62 passed. In the November 2015 exams, UPLB led the schools with 96.61% or 57 out of 59 successfully hurdled the tests. UPD got the second highest place with 89.89% or 80 out of 89 passed. Monitor this page for the real-time updates on Civil Engineer board exam results. Check out also the official website of PRC for more information.